Those lucky folks who got the most recent update for DIRECTV Genie are still working out the kinks. This is going to be a very long and slow process for DIRECTV customers as their feedback is taken into account as new features are added or changed. The old menu system was full of dead-end shortcuts that were very rarely used. The new system does away with some of them, but others are simply hidden away. If you’re looking for something to record, you might want to go to a specific date and time in the DIRECTV guide. You can use the fast forward and rewind buttons to go forward and back 12 hours, but if you know exactly when and where you want to go, you might want to jump straight there. This used to be done by pressing the DASH button to the left of the zero, or back in the old days with the yellow button, but since the DASH button is now used for search, power users have found themselves a little confused as to where they can go for extra guide options. Luckily that little submenu isn’t gone, it’s just harder to find if you don’t know where to look. 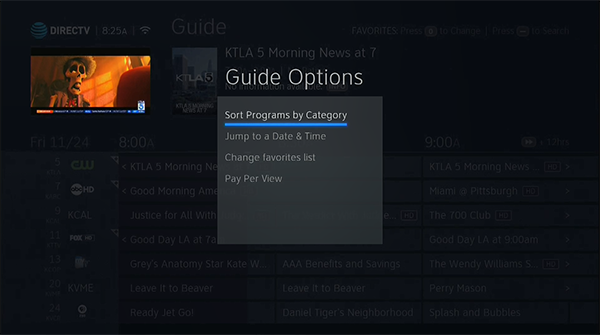 All you have to do is press the ZERO button and you will see the guide options screen where you can sort by program type or go to a specific date and time. The screen looks pretty much identical to the way it used to look, once you realize that all the 2010-era shininess has been moved off. It’s just as easy as it ever was to go to a specific date and time in the guide, luckily for you.